Charlotte is so excited. She's awaiting a new baby in the family, but she's not the only one. Mummy is carrying the baby in her tummy. Dad is reading to baby, through the walls of her belly. Nan is knitting for baby and Pa is putting the cot together. Aunty Jen and Uncle Wade are helping, too, and even the neighbours, teacher, doctors and nurses are involved. They all care about the new baby. They all have a role to play. 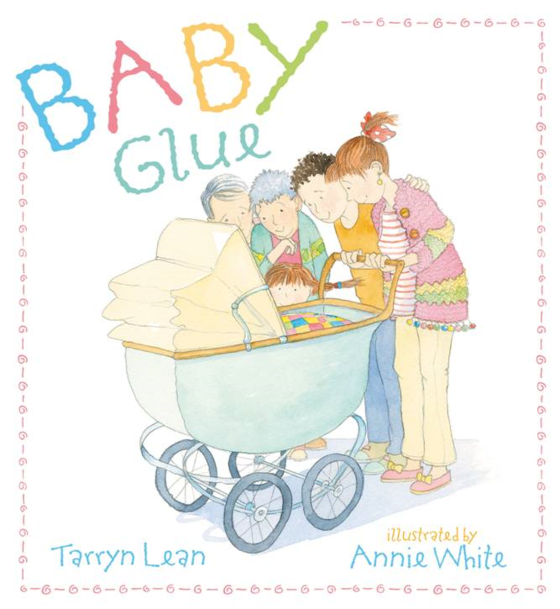 This debut book by Tarryn Lean is a wonderful way to reconnect kids with the idea of family as community--that we are not alone, and that so many people play a part in raising children--or rather, that they should play a part. I love that this book opens the dialogue on this concept with kids, and that our increasingly introverted society takes note of that classic adage: It takes a village to raise a child. With typically gorgeous illustrations by Annie White, Baby Glue is an adorable and important book.